Whether you are into backpacking in the woods or preparing for disaster, people require protein for physical and mental health. Beef jerky is a time-tested way to carry light-weight fully prepared high quality protein with you wherever you need to go. The cooking process of dehydration retains vitamins, amino acids and nutrients lost and broken down with all high temperature cooking methods. Roughly speaking, 3 pounds of beef renders down to about a pound of jerky, while only water weight is lost and all goodness remains. The high sodium content of our marinade insures freshness for months to come without need of refrigeration. Best of all, no further food preparation is required. 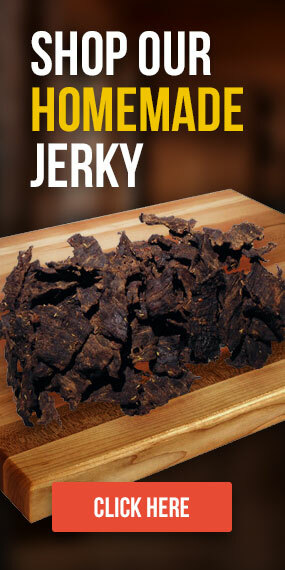 Jerky protein is ready to consume when you need it. Oh, and it tastes awesome too!